It plays beautifully: it is really comfortable and it sounds beautifully. I have only one minor gripe with it: if I don't touch the strings or the bridge and I touch one or more toggle I hear a continuous noise coming from the amp. Do you know what could cause this problem? Is it solvable? luigir wrote: I have only one minor gripe with it: if I don't touch the strings or the bridge and I touch one or more toggle I hear a continuous noise coming from the amp. This is most likely a problem with the bridge ground connection. More information here. It could also be a problem with the bass' ground connection at the jack, but the bridge ground is the first place I'd look. Thanks so much for the suggestion. If its just a ground issue I guess it's not a biggie. I guess I'll bring it to a technician soon. The more I think about it, the more I think that it might not be bridge ground. It might be a grounding issue inside the cavity. The problem is where. 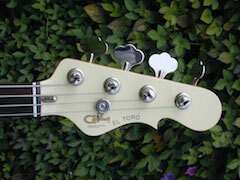 You should have your tech give the bass a very thorough inspection with the focus on finding an open ground. 4. If I touch one (or more) of the three toggles AND the strings: there is no noise. I'll bring it to the technician this or next week. I'll post his replies on this forum in order to help somebody with the same (minor) issue. Yesterday evening I've decided to take a look by myself before bringing it to the technician. I have opened the compartment and I've noticed some sawdust floating here and there around the board. I have blown it away and that's it: problem gone! I guess that sometimes just a little bit of cleaning could be more than sufficient! I had a similar problem on my Indonesian L-2000 a few years back, it took some tracking down. The cavity shielding ground relies upon the pot with the ground wires soldered on the back for it's connection. On mine, and I suspect it is the same on yours, the pot back was not making a good contact with the body so this ground connection was intermittent. Touching the switches got rid of the buzz but not the knobs because they have a plastic bush in them so are insulated. I added an extra ground wire that I trapped between the cavity shielding and the pot mounting boss and it has been fine since. If yours went away when you took the control cover off and disturbed a few things my guess is that it will be back sometime. A bit of loose sawdust or polishing compound wouldn't give you that fault, but it is best to remove it as it could get into the pots and cause them to be scratchy.